Healthcare is becoming more complex every day. With new government programs, existing programs changing, how we interact with customers changing, not to mention increased regulation, it takes real thought to hone processes to keep up. 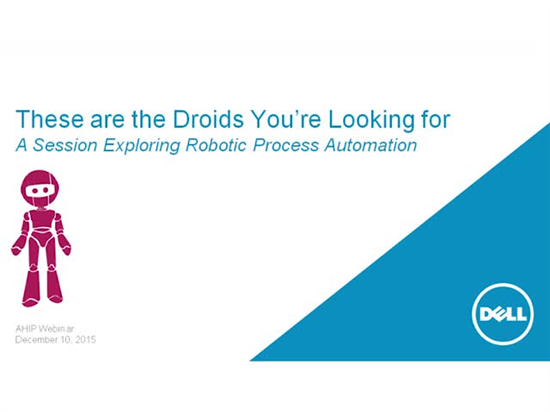 Enter Robotic Process Automation (RPA.) RPA can be described as software agents that complete repetitive tasks in business processes, freeing human workers to do higher value work. Dell Services has deployed its RPA solution — Automated Full –Time Equivalent (AFTE) — with a number of customers to help them increase productivity and accuracy, as well as keep up with their increasingly complex environments. AFTEs have helped BCBSRI reduce manual workloads by 25 to 30 percent. The robots learn on the job—after they are stopped in a process, they incorporate any learnings and apply that knowledge the next time they encounter a similar situation. If you’d like to hear more about BCBSRI’s RPA implementation and tips on how to deploy RPA in your business, listen to this webinar, These are the droids you are looking for, as Dell Services Health Plan experts talk with Carlson about how AFTE has helped them manage this new complex healthcare world.